My great grandmother-in-law Molly was born and reared in the Ukraine. I never had the chance to meet her, but have heard many stories throughout the years about her culinary acumen. She was, reportedly, an excellent baker – turning out crusty rye breads, sweet buckwheat pancakes and many other delicacies. Molly moved to the Midwest in her twenties and later taught my mother-in-law Rosella to prepare “kasha varnishkes” or whole grain buckwheat groats with noodles. The name “varnishkes” seems to be a Yiddish alteration of the Russian “varenichki” which translates to stuffed dumplings. Also known as “Jewish soul food,” kasha is a staple in Eastern European countries. 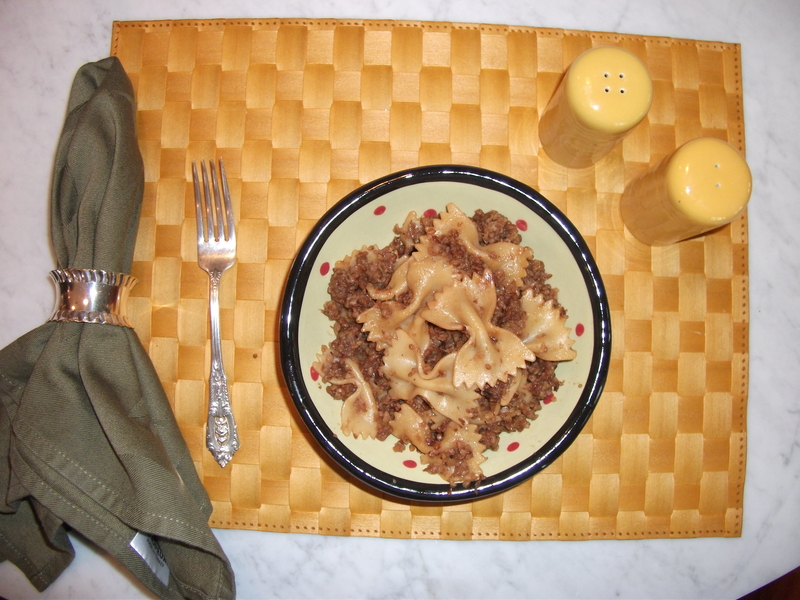 When I first met my mother-in-law, she placed a huge, steaming bowl of kasha varnishkes in the center of the table. Not familiar with groats – which have a dark, pearly, grain like appearance – I was at first a bit tentative. But my husband piled a huge portion onto his plate and started eating with such gusto that I felt compelled to follow suit. I was delighted by the dish after my first bite. Small bits of onion were singed and almost burnt – lending them a deeply caramelized flavor. The combination of chewy grains and succulent noodles was extraordinarily comforting. Nearly every visit, my mother-in-law would have a huge bowl of this dish ready and it inevitably disappeared within a day. She taught me how to prepare it and I taught my own kids. Kasha has become a family tradition. Granted, it has changed a bit from the original recipe of the olden days. I tweaked it by substituting olive oil for chicken fat and now I use whole wheat bow tie noodles. Regardless, every time I taste it I think of Molly Weissman stirring her huge pot of groats and noodles and doling out this soothing delicacy to her own family. Over medium flame, heat the oil in a large heavy, straight sided sauté pan and turn on the exhaust fan. Add onions and sauté them with about 4 grinds of pepper and ¼ tsp salt until really deep golden. Be sure to stir every 3 minutes or so. This can take a total of 30 minutes. Remove onions to a plate. You don’t need to clean or wipe out the pan! Beat the egg in a small mixing bowl and stir in the kasha. Mix, making sure all the grains are coated. Put the kasha in the same heated frying pan, set over a medium high heat. Flatten, stir, and break up the egg-coated kasha with a fork or wooden spoon for 5 minutes or until the egg has dried on the kasha and the kernels are very brown, aromatic and not stuck together. Remove the pan from the burner and add the water, salt, and pepper to the frying pan and bring to a boil. I strongly recommend that you wear oven mitts as it splatters and steams. Add the sautéed onions, cover tightly, and cook over low heat, steaming the kasha for 10-15 minutes or until it is really puffed up. Remove the cover, stir, and quickly check to see if the kernels are tender and the liquid has been absorbed. If more cooking is needed, cover and continue steaming for 3 to 5 minutes. Add more water if it seems too dry. Meanwhile, bring a large pot of water to a boil. Cook the bow-tie noodles according to the directions on the package. Drain. When the kasha is ready, add the noodles to the fry pan and stir together. Although it’s not tradition, you can garnish this with chopped fresh parsley to add some color. Serve alone with a salad or with some sliced pot roast, fish or stuffed chicken. I often have it with oven roasted vegetables on top. 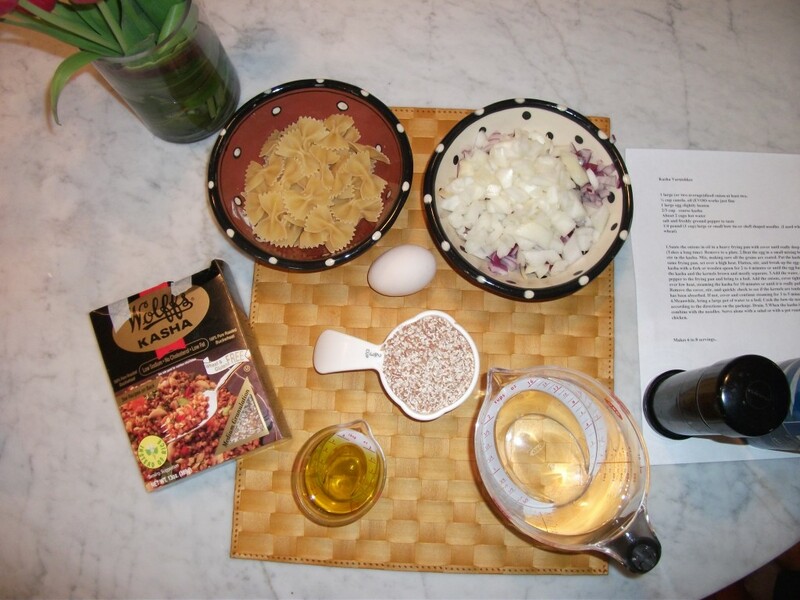 This entry was posted in North America, Side Dish and tagged Kasha Varnishkes. Bookmark the permalink. Comfort food is just what the doctor ordered this week. I love hearing about your extended family, and your culinary roots. I wish I’d known more about what my grandmothers (especially my father’s from the Poland-Ukraine region) cooked. I do know that she made some mean latkes! I don’t have a clue what my grandmothers made..my maternal grandmother passed away very young and my dad’s mom didn’t cook much and was purportedly not great in the kitchen. That’s why I promised myself and my kids that I would actually document my recipes and tell stories about their origin.